Formal shoes, jackets, laptop bags and belts — Leather Forum, at the heart of Kammanahalli, is the place to pick up stylish accessories. Prices begin at INR 650. A compact store on Kammanahalli’s arterial Nehru Road, Leather Forum specialises in export surplus leather goodies. Much of the store’s shelves are dedicated to men’s shoes. 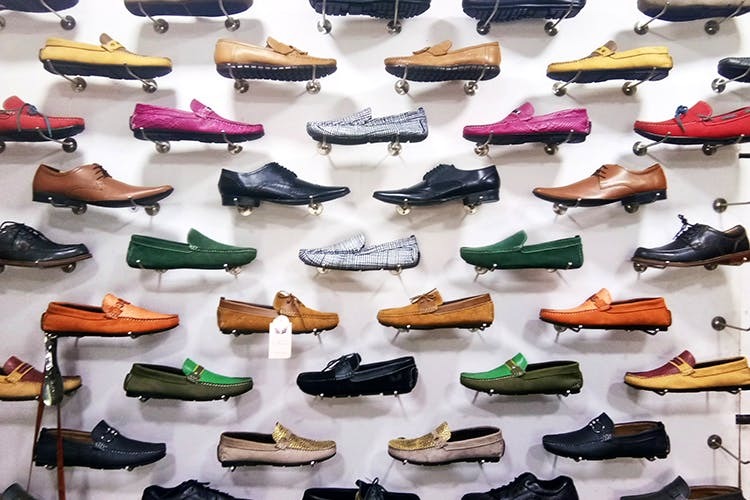 We particularly love their collection of loafers (INR 950 onwards) that come in a range of eye-popping colours like brights oranges, moss greens, serene blues, and, even, rani pinks. These are perfect for those of you who love to experiment with what goes on your feet and are best suited for a casual look. They also have a pretty neat collection of dress shoes that will work splendidly for work or when you are hitting up a formal occasion like a wedding. These are available in black or shades of brown and you can choose between lace-ups and slip-ons. The store also has a range of sandals and these begin at about INR 650. Get your swag on with custom-made jackets from here. You can even order up laptop sleeves and bags as well as messenger and sling bags. They take about a week to deliver customised orders.